IDEA NETWORKING OPPORTUNITIES. On this page we will be posting ideas sent to us by our customers. The cholera outbreak in Haiti has resulted in over 600,000 cases and 7,943 deaths (Pan American Health Organization [PAHO], 2013). 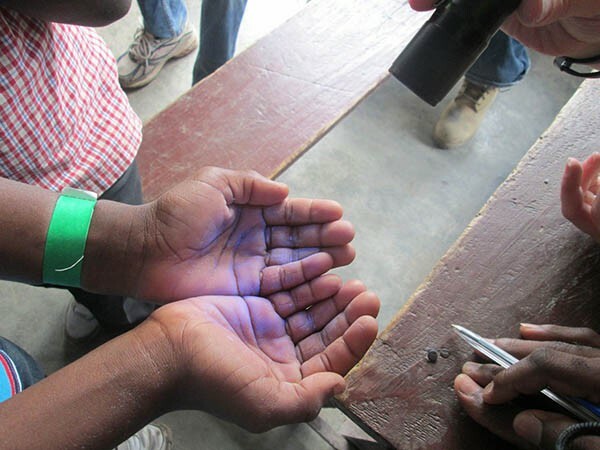 The Ministry of Health in Haiti (MSPP) has identified cholera management as a high priority for 2013 (United Nations Office for the Coordination of Human Affairs [OCHA], 2012). In accordance with this goal, school clinic staff (nurses and doctors) from the Christianville Foundation, collaborated with the community action team at Christianville and a University of Florida intern to conduct cholera prevention workshops with students during the months of February and March. For a period of three weeks, the team visited several schools in the Gressier area. Prior to the school visitations, the nurses and intern conducted a cholera management and community engagement training program with the community health workers and directors from the Christianville schools. The community health workers applied information from this training session to develop a plan of action for the 45-minute classroom sessions. In each class, students were lead in a discussion about basic facts of cholera, including epidemiology and prevention methods. The key prevention message addressed the importance of adopting good hygiene practices, specifically that of regular hand-washing. Students were taught one of three prevention songs based upon their grade level: kindergarten students where taught a basic song about washing hands; primary school students learned a song explaining how to prepare oral rehydration serum; and secondary students learned a produced song explaining the process of cholera eradication. 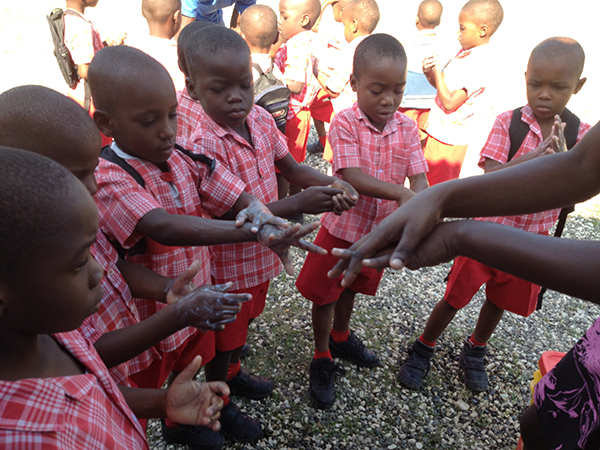 Students also participated in a hand washing activity using GloGerm™, a health education tool that reinforces proper hand washing technique. The GloGerm™ product (available in liquid and powder form) is a simulation of germs that glow when placed under a LCD light. 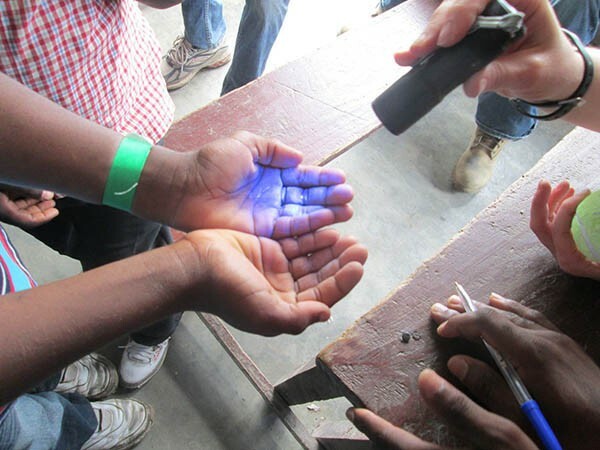 After putting GloGerm™ on the hands, students were able to view the ‘germs’ using a black light. 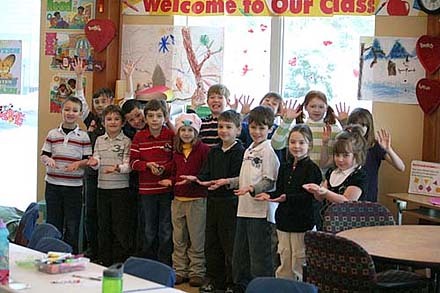 Students were instructed to wash their hands and after had them reexamined to determine if they used proper hand-washing technique. If proper technique is used, there would be no GloGerm™ residue. The team was able to conduct the workshops with the entire student population at each school site. In all, over 1200 students participated in the prevention workshops. 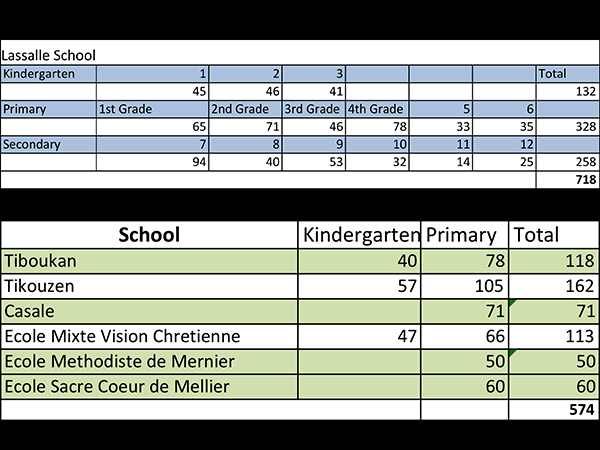 (See Tables 1 and 2 below for breakdown of schools and students). Students’ ages ranged from three to twenty three years old. The workshops were successful in disseminating pertinent prevention information to help mitigate the spread of infectious disease. On behalf of Phi Delta Chi, I want to extend our utmost thanks to your company for donating the GloGerm supplies including the kit, temporary tattoos, training materials, and Buster the mascot. 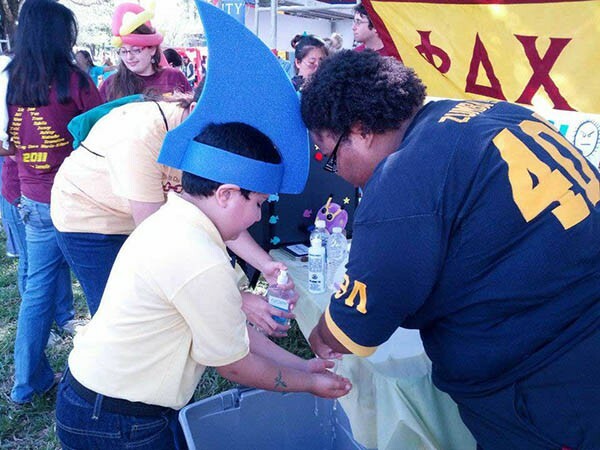 Because of your kind donation, our pharmacy fraternity was able to carry out a Fight Germs, Wash Your Hands activity at our CommunityFest. 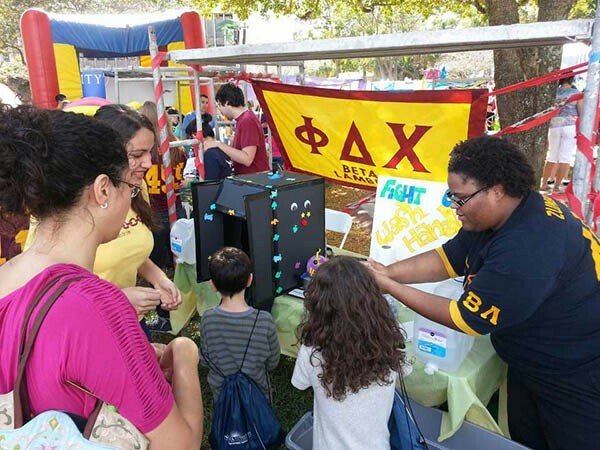 CommunityFest is an annual festival that celebrates and connects the community of Nova Southeastern University and their families in a carnival-like atmosphere across a large area of our campus. 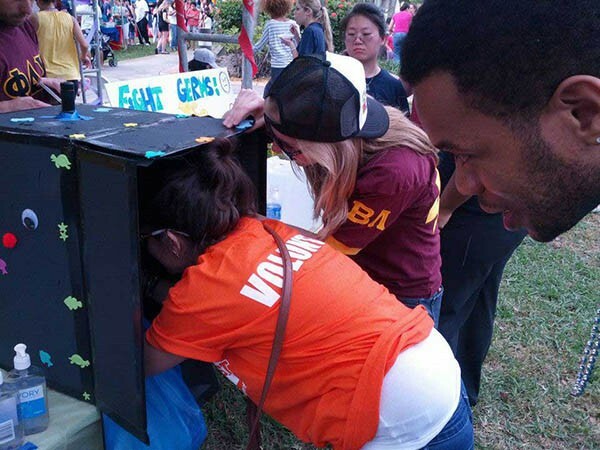 Local businesses are present sharing food and cheer, and almost every organization on campus puts together a "booth" of their choice which provides activities for all the participants, especially the children, that attend this festival. 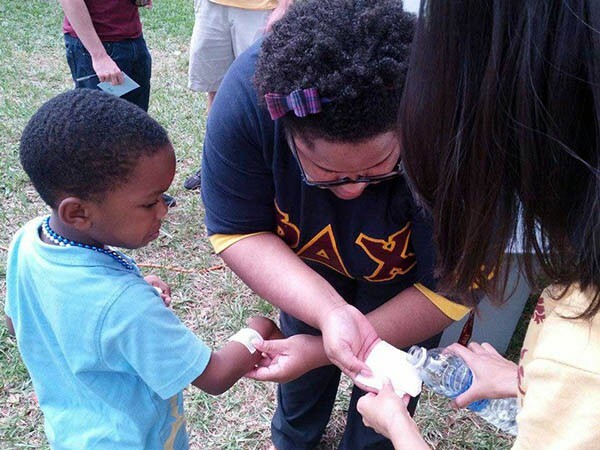 Phi Delta Chi hosted an activity called "Fight Germs, Wash Your Hands," in which over 25 of our Brothers engaged around 100 children and their parents in proper hand hygiene and the importance of preventing the spread of germs and ultimately disease within the community. We utilized the GloGerm supplies to demonstrate that although germs may appear invisible, even after simple hand-washing, they can still be present. 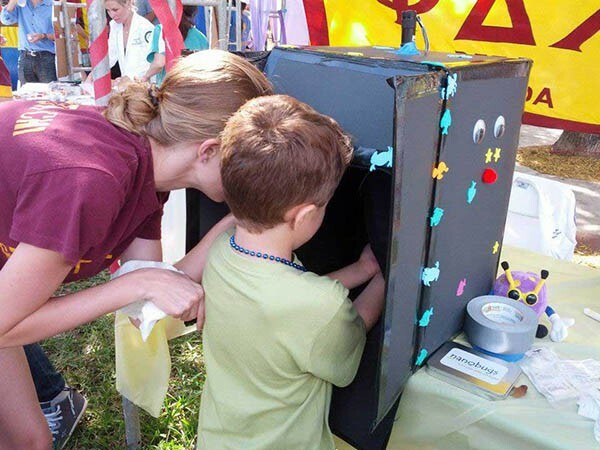 A handmade “Glow Box” was created by one of our members which allowed the children to peek inside and observe the "invisible germs" under UV light. They were asked to look into the Glow Box after applying the Glo Gel, and a second time after washing their hands as they know how to do so. For many children, some of the Glo Gel, or "germs," was still present under UV light, even after their simple hand washing. From this fun activity, the children were taught proper hand-washing techniques outlined by the New England Journal of Medicine. The purpose of sharing these guidelines was to reiterate that knowing how to wash your hands the proper way can more effectively prevent the spread of germs to others. After completing the activity, all were welcome to a Nanobugs temporary tattoo. Since the tattoos displayed various viruses, bacteria, and fungi such as H1N1, rhinovirus, influenza virus, and campylobacter, we were able to share descriptions of each and how one could avoid the said "bad bug." 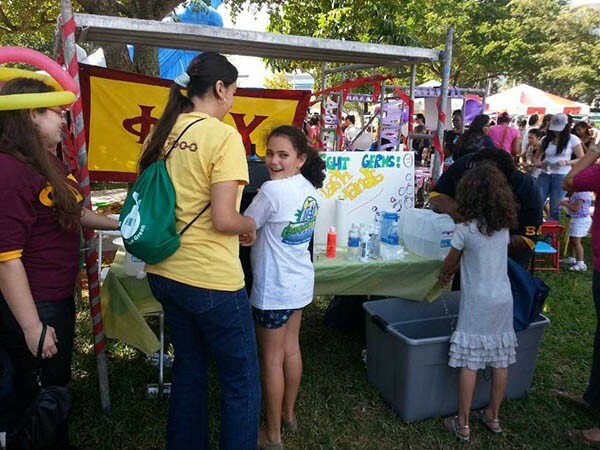 The whole day was filled with fun and learning, and our organization greatly enjoyed using the GloGerm products to engage festival-goers in this special activity. Without your kind generosity, we could not implement such an impactful event within our community. Thank you again for your donation, as we are ever grateful and appreciative of these items. 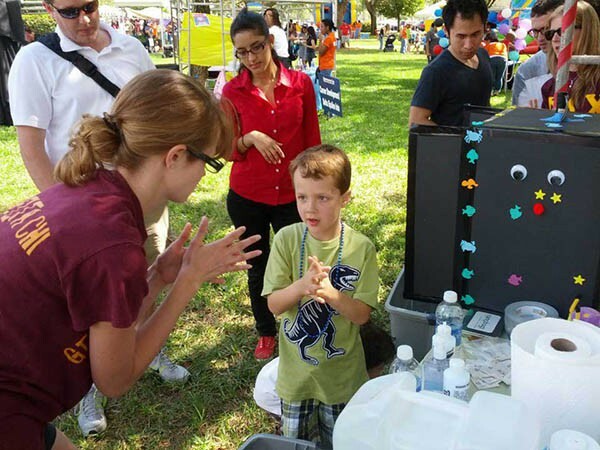 With the GloGerm products we plan on further investing and expanding our booth for future events to continue bringing awareness to fighting germs and the use of proper hand washing techniques. Attached are a few pictures from our event that we hope you can utilize in some way to share what great awareness activities can be initiated from the use of your products. Thank you again for allowing us this opportunity to utilize the GloGerm materials with our dearest community. About a year ago my parents came to visit me in my village in Cameroon where I work in Public Health as a Peace Corps Volunteer. They brought me some GloGerm products that you had graciously donated. I am back in the US on vacation and have access to great internet and wanted to thank you again. I used the GloGerm products with health care workers from my rural health district in the mountains of western Cameroon. After working with them on these hygiene concepts and using your products, hand washing compliance has increased. As part of a cholera prevention campaign during a cholera outbreak, I also worked with over 1000 school aged children on these hand washing concepts. Thank you so much for your donation! 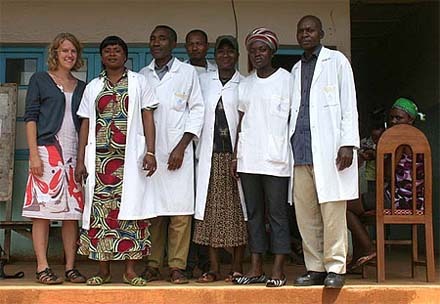 Attached is a picture of me and the health care workers at one of the rural hospitals. 19 members and I from the Rutgers University Chapter of Unicef lived at an orphanage in La Colorado, Honduras for two weeks. For the first week, we helped the children and the people running the orphanage. As for the second week, we ran a one -week camp, covering certain topics to teach the children English. Some of these topics were greetings, numbers, the alphabet, seasons, and the parts of the body. We also discussed specific public health topics with the children, such as hand washing, nutrition and health, dental hygiene, and abuse and violence. 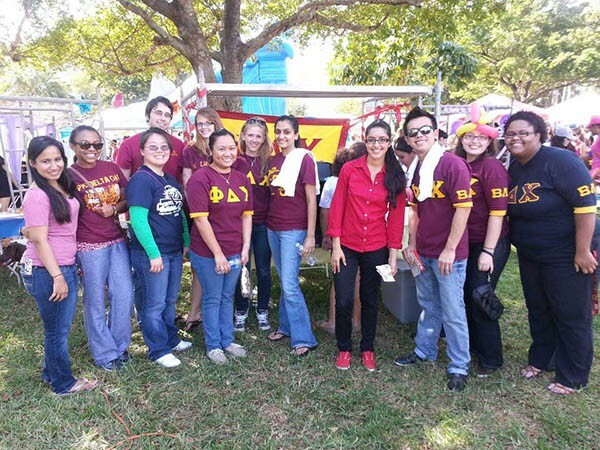 On January 10, 2011, the members from the Rutgers University chapter of Unicef began their one-week camp for the children of a town in Honduras. The hand-washing lesson was the first public health topic discussed with the children. 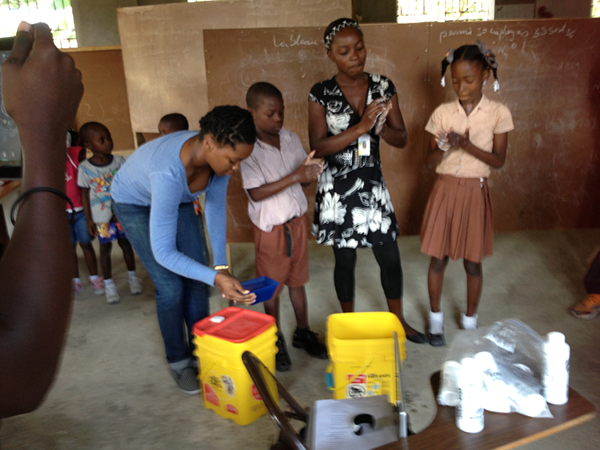 For the hand-washing lesson, we had three stations set up because many children had arrived for the camp. One station had a power point and a video dealing with how,when, and why the children should wash their hands. The next station was a short skit done by the college students in Spanish on the germs that may affect the children if they didn’t wash their hands. And finally our last station was about the “Glow Germ kit” that made the “germs” visible to everyone. The children all sat in a circle and started to rub their hands as we put powder in them one by one. As the UV flashlight’s light reached their hands, the children’s expressions conveyed it all. Their eyes grew large in surprise and shock. Some children couldn’t believe how many “germs” they contained on their hands. One child said, “put it on my feet too!” You could just see and hear their excitement as some yelped- while the little ones put their hands over their mouth because they were taken aback. 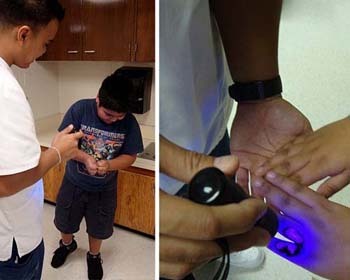 After using the flashlight, we told them to wash their hands thoroughly and asked them to look at their hands to see if any germs were still there. After washing their hands though, many still had some ‘germs’ on their hands and if any of the college students said, “Oh, Oh, not good,” the children quickly ran back to a faucet nearby, to wash their hands yet again. They came running back and wanted to see if the “glowing germs” had disappeared-, which they had! And finally, only then would a smile and a sigh of relief come on their faces because the germs had disappeared. By observing their reactions, I realized the children had a better understanding of the importance of washing their hands and were going to incorporate it more in their lives. It made everybody, from the ages of three to fourteen - even the caretakers of the orphanage, realize how important hand washing really was. On behalf of the Honduras travel team, we are very grateful to the Glo Germ Company for your donation and want to thank you for giving the children a chance to experience this great opportunity to learn in an educational, yet, fun and captivating way that they will remember. Vital Links for Humanity, Inc.
Kara Streit is an Elementary Education student at Ball State University. She recently had to complete a project for a health science fair for third grade students. Kara was able to incorporate Glo Germ into her project and the following text and pictures are the result. Thank you Kara for sharing your work with us. Throughout the day of the health fair we had approximately 200 students attend our booth. We discussed with the students what a germ is, how germs are spread, and how to stop germs from spreading. Our main focus however was to center on how to stop germs from spreading. This brought in the Glo Germ activity for the students to participate, which they really enjoyed. 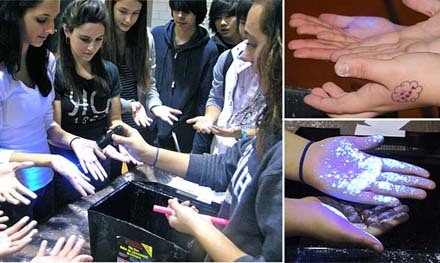 We had the students rub the Glo Germ lotion on their hands and view them under the black light. A majority of the students were shocked at the way their hands looked under the ultra-violet light. Throughout the experiments, students kept saying that they were going to start washing their hands better. My group and I really enjoyed this activity and presentation for the students. We were excited to present it to them and work with them on how to help prevent the spread of germs. We just want to thank you again for your generosity for the donation that we received from the Glo Germ Company. It greatly helped the students and even us as a group become more aware about germs and how important it is to wash your hands very well on a regular basis. Thank you very much for the opportunity to show my sixth grade girl scout troop the benefits of thorough hand-washing. I purchased one of your kits last month and our troop used it during a progressive sleepover dinner. During the evening, the girls completed activities to earn a junior badge called “Let’s Get Cooking”. One of the activities was called “Keeping It Clean” and suggested using apples, jars and clean hands and dirty hands. The activity was to take two apple pieces, wash one apple piece and then wipe it with dirty hands and place it in a sealed jar labeling it “dirty hands”. Then after washing hands, you are to take the second apple piece and wash it, then wipe it with clean hands and place it in a second sealed jar labeling this jar “squeaky-clean”. After one week, the girls are to observe both apple pieces and answer questions such as: Are there any differences? And how does this experiment demonstrate the importance of washing your hands? 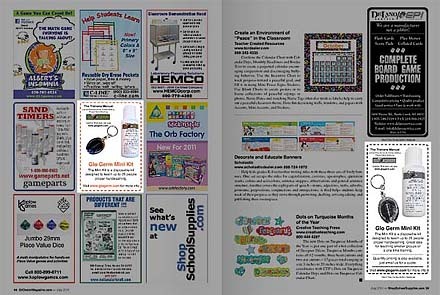 I learned of your product through a friend a few months ago and when I read the above activity from our girl scout badgebook, I immediately thought of glo-germ. I thought that it would be really great if the girls could earn the cooking badge in one evening and not have to wait a week. Also, after spending some time at your web-site, I was convinced that your product would show the girls not just how important it is to wash their hands, but to really wash them thoroughly and to think about how easily and quickly our hands can pick up germs from anything and everything. Thank you again for such a great, fun and educational experience. And thank you for allowing a discount on your kit provided our girls wrote down their observations and reactions. Attached are their comments. I’m giving this kit to our service unit leader so that other troops in our service unit can reap the same benefits we did. I sprinkle a small amount of Glo Germ powder (like pepper on a salad) on my hand which I use to 'shake hands' with. Then, just shake the open hand out over the floor to get the excess to drop off. (This has the best effect when done without the students seeing you put the powder on your hands. When I have not choice, but put the powder on in front off my 'victims'; I always say to their face: YOU DID NOT SEE ME DO THIS, OKAY? ?...and they almost always say,Okay!). Shake hands with the first student and then the best demo is to have that student shake hands with a second and so on....the Glo Germ trace will usually go to 5 to 6 students...if you can see the Glo Germ under the UV light...you will have caught the flu or whatever you name the "bug". A variant of the above is when the 'victims' do not know of the Glo Germ's presence and you let 15 to 20 min go by to let the natural contacts continue. This is even more striking! ie a sneeze....Take two heaping tablespoons of Glo Germ powder and mix thoroughly with two cups of olive oil (or similar type of light oil). Let settle over night and then decanter as much of the oil out as possible. Get the remaining oil out by putting the mixture into cloth and wring out any additional oil. Mix the oil coated powder into a pint of water. Shake well. This solution can then be put into a spray bottle for the simulation of a sneeze or wet bio security attack. Please note if the solution spoils any clothing, it can be washed in warm water and Tide liquid. Do not wash clothing with Glo Germ contamination in Hot water. The Glo Germ particles have a very low thermal mass and will 'melt' into the cloth permanently. 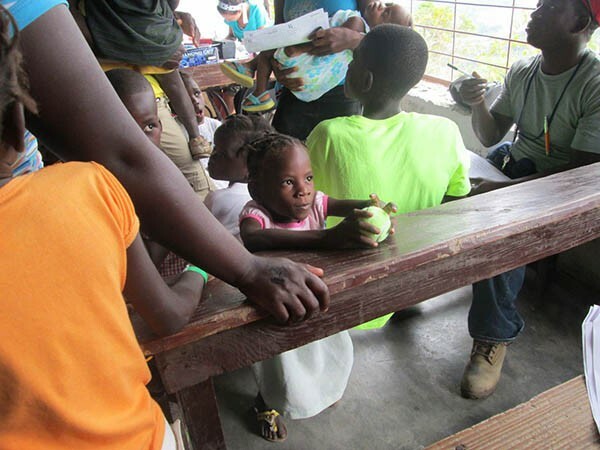 Our team was in Chabin Haiti, a small mountain community outside of Jacmel in southern Haiti. There we held a 4 day clinic on the site of a church and school. During our time there we were able to see 383 patients, give 8 vaccines, 19 IM antibiotic injections, 5 blood glucose testings, do 5 wound treatments and give out 1233 prescriptions. On our last day of clinic, there were no people left waiting, all who were present were able to see the doctor. What a blessing to know all were served. 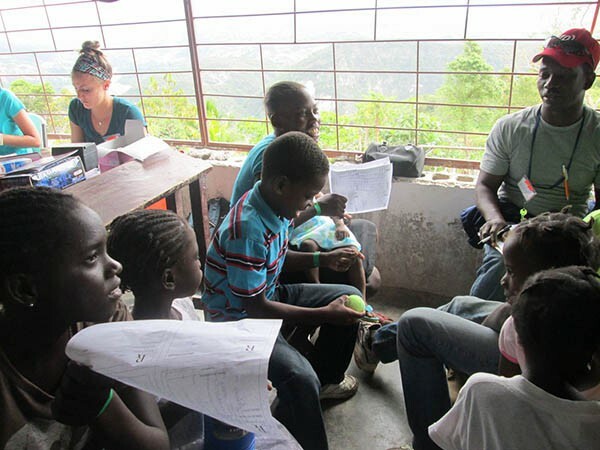 Our team this year was made up of 2 Haitian physicians (whom we partnered up with last year and were gracious enough to join us again this year), a physician from the US, 2 pharmacists, 8 pharmacy students, 2 nurses and a technical support/event coordinator. 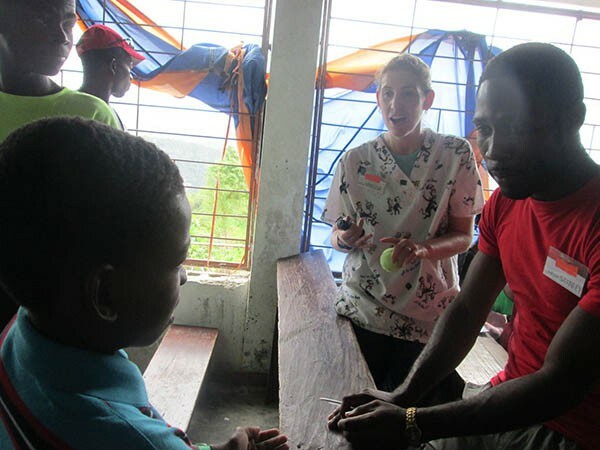 This being our second trip, we knew a little more about what to expect and wanted to provide the patients waiting to see the doctor with some education. Many patients waited for hours to most of the day to see the doctor and get the medicine they needed. One thing about the Haitians, they are so happy to be getting care from a doctor, they don't complain at all about waiting. Such patient, humble and appreciative hearts there! We chose hand washing and brushing teeth as our subjects this year for 2 reasons, the health benefits of both, and we were passing out washcloths, soap, toothbrushes and toothpaste to all patients seen at the clinic. 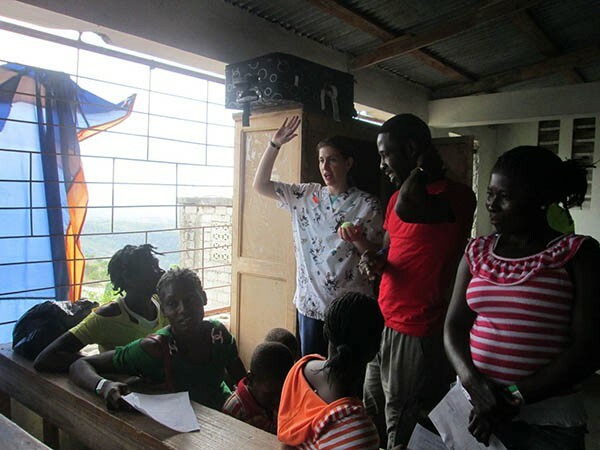 We were able to do teaching sessions to about 10-15 patients at a time, and did about 6 sessions or so each day, depending on the flow and busyness of the clinic. As I guessed, we were unable to use the gel, for the simple fact we had no running water at the clinic. 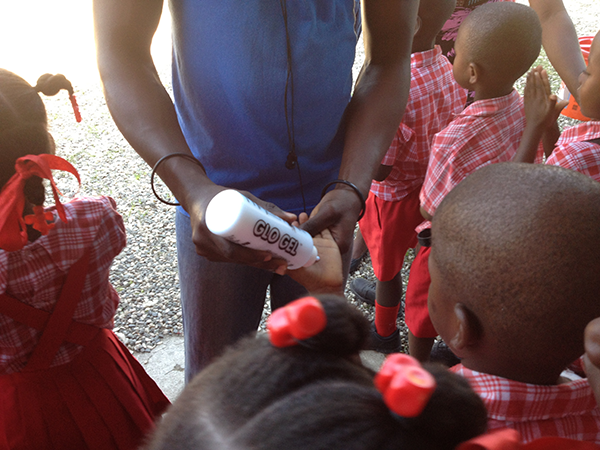 (Hand sanitizer is a life saver in Haiti!!) We discussed the importance of hand washing and all things related to hand washing during the demonstration. Then we did a question and answer session with the patients, throwing the ball to them for the answers. After throwing the ball around, we were able to show them the "germs" they were coming into contact with, without realizing it. Then we reinforced the reasons for washing your hands and when. The children's faces were precious when they got to see what was on their hands, and they were so excited to tell us the answers to our questions. Many of the adults even got into answering the questions, happy that they also knew the answers. We got some thank yous as well from the adults for the good information, teaching, and the supplies to practice their knowledge for the benefit of their health. 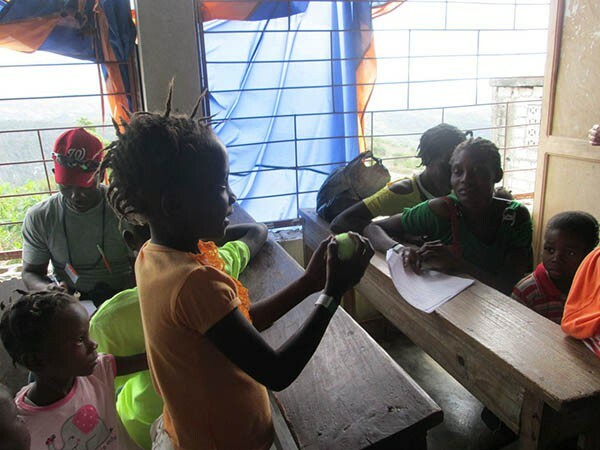 The literacy rate in Haiti is very low among the adults, so I think that they took in the demonstration as well as the children. I think that in a different situation, we would be able to use the gel as well. I thought about getting a bucket of our drinking water and having patients wash hands to show if they were doing it properly, however with the logistics and busyness of the clinic this year, that didn't happen. I also wonder how long our water would stay clean enough to show good hand washing techniques. 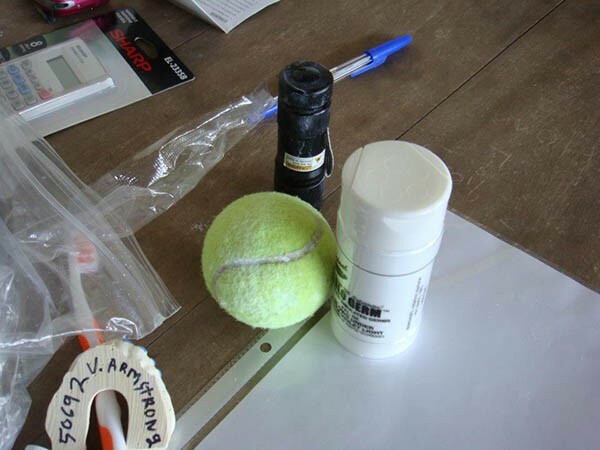 We have saved the supplies you gave us and will definitely be using them in future trips! Thank you again for your generous donation and suppport of our group! 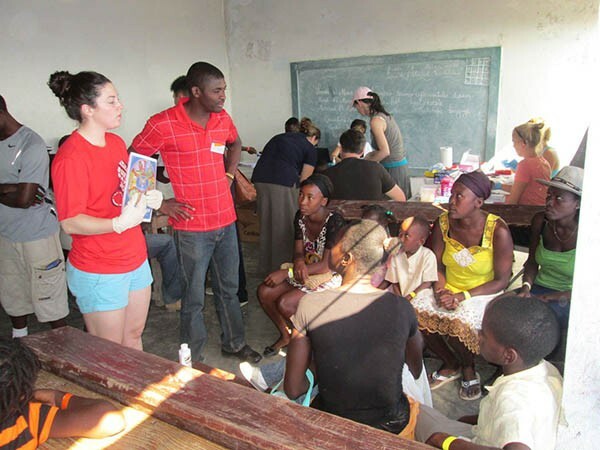 The education piece was a great addition to the work we do in serving the healthcare needs in Haiti. Attached are a few snapshots of a few of us in action with the glo germ. Hope you enjoy! If you'd like any more information or updates on our trips, feel free to email me or check out our website at www.reachh.org.There is a blog section on our website where you can read more. 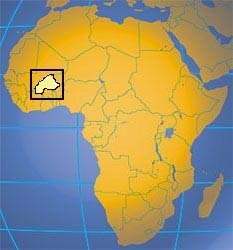 Deou is a poor and isolated region in Burkina Faso, one of the world's poorest countries. The area suffers a severe water shortage in the dry season as wells dry up, cattle and crops die and women and children travel long distancesfor enough water to survive. Health is threatened by lack of clean water and improper sanitation and hygiene practices, and diarrhoeal disease is rampant. On Monday 22 November 2010, Thomas McKean High School hosted the first annual Highlander Health Fair presented by Molly Alawode, the HealthCorps coordinator, and the school’s Wellness Council. HealthCorps, a proactive health movement founded by heart surgeon and Emmy Award-winning talk show host Dr. Mehmet Oz, is fighting the obesity and mental resilience crises by empowering American students and their families to become health agents of change for their communities. A 501(C)3, HealthCorps is helping the country reach the tipping point towards wellness now and for the future of our children. A high-energy obstacle course... because it's fun! 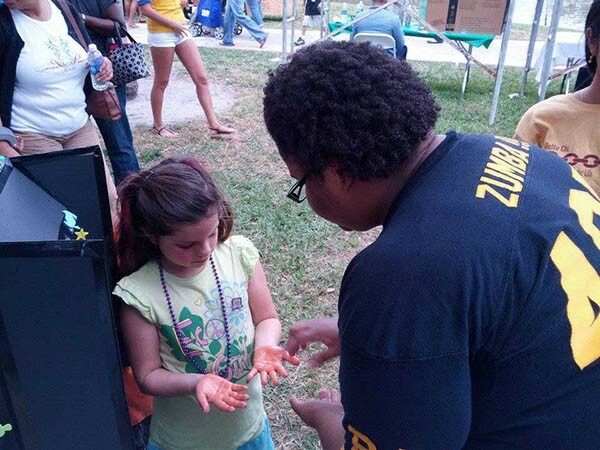 The students loved the Glo-Germ booth! This station was run by the school nurse and a group of student volunteers. They spread the Glo-Germ powder on the table. Then they told booth visitors to pretend that the table was their 8th period desk. The booth visitors touched the desk as if they were in class and got the powder all over their hands. Then the booth attendants shined the black light on everyone’s hands and they were shocked at what they saw: germs in every crevice of their hands and fingernails! They were also amazed by how many germs are on items found in schools, like desks, doorknobs, chairs, etc. The attached photos better illustrate their astonishment. Thank you again for your generous donation of the GloGerm mini kit. On Novemeber 17, 2010 two fellow students and I went to Pinellas Central Elementary School in Pinellas Park, Fl. We presented a hand washing demonstartion to Mrs. Beckenstein's 3rd grade class. The experience was amazing. The kids were energetic and so ready to learn with the handouts that were provided in your kit. They were competitive to see who got to wash their hands first, who finished the crosswords and handouts first. We have been focusing on child care throughout the semester and child abuse in psych, so actually working with the children and seeing them so happy to learn, and the way they were interested in our presentation, was a first hand teaching opportunity tool that just would not have been the same without your GloGerm kit. As you can see from the smiling faces in the pictures the kids had a great time and learned alot too. They could not believe how many areas they missed when they washed their hands. I particularly like the picture of the students hand where it shows the spots he missed under the black light. It turned out great, didn't it? Your product is an awesome teaching tool. The children at Concord Christian Academy have clean hands AND a pure heart. That's right, on Thursday, January 21, 2010 grades pre-k through 6th grade were given an in-service with demonstrations on hand-washing. Supplies were donated by Glo Germ Company. The children all learned that germs and bacteria can not be seen by the human eye. A demonstration using a spray water bottle showed how germs and bacteria can travel from one student to another very easily. Water was sprayed on one students hand then they would touch the desk, then another student would touch the same spot on the desk and showed the class that their hand too was then wet. Their hands never even touched. Germs and bacteria travel in much the same way. The childrens voices were elevated as they saw their hands under the ultra-violet light with the "glowing germs" from the lotion given by the Glo Germ Company. The kids then washed their hands and repeated the process to see if they had washed their hands thouroughly. They learned that there are places they should not forget when hand washing, especially around the fingernails and rings. The younger children did not always remember to wash the backs of their hands. Several children realized that cuts and scraps need a bit more soap and water for cleaning. After the fun was had the children completed their game or coloring sheet on hand-washing while Tom and Sue Calkins gave instructions on exactly how to wash hands thouroughly to keep all the children happy and healthy at Concord Christian Academy. Lastly, the children signed their name at the bottom of their instruction sheet to pledge to wash their hands and all agreed to support and encourage one another in doing so. Fun was had by all. The whisper of clean hands continued even into the proceeding days at school. Thank you to the Glo Germ Company for providing the supplies for this possibly life saving in-service to our school. The pictures show all the fun. The last 3 pictures are of the second grade class. The first two are of them thanking the Glo Germ Company and the last one is of them acting like the germs are all over their bodies. We've used GloGerm in our educational activities. The response from the course's participants was great! 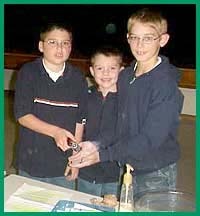 Christopher Fales of Victoria, TX, recently used the Glo Germ product to teach his 4-H group about germs. "Everyone really liked seeing how easy germs are spread," said Christopher. "And everyone had a great time while learning." Congratulations Christopher on a great job teaching others about germs. Below is an inservice I put together on dry skin for a handwashing push during Infection Control Week. I've always loved the Glo Germ products for teaching handwashing. My favorite place to teach is school - the kids get such a kick out of their glowing hands! I would like to submit this to your on-line newsletter or letters to the editor in your catalogue. Objective: The employee will be able to state three measures to help prevent dry skin. Your skin protects you from exposure to harmful irritants and potentially pathogenic organisms (also called germs). Damage to the skin (ex: dry skin, chafed, cracking, etc.) negates this barrier function. This may allow disease causing germs to "get under your skin!" Non-intact skin increases your risk of acquiring a bloodborne disease if your bare skin is exposed to blood or body fluids or acquiring a skin infection if exposed to bacteria. Cold weather, low humidity, age, dietary deficiencies, some medications, some medical conditions, frequent handwashing, and exposure to harsh products and chemicals contribute to dry skin. Wear gloves and warm clothing when it is cold. Wash with warm, not hot, water. Hot water opens your pores and allows natural oils to escape. Wear protective gloves when cleaning or handling chemicals (at home and at work). Nitrile gloves are generally the most chemically resistant. Use skin care products that are mild, pH balanced, and dermatologist tested. Apply appropriate moisturizers often, preferably when the skin is damp. This is best at night when you can put on cotton gloves to retain the moisture. Paraffin hand baths can also help to replace moisture to dry skin. Seek guidance from a dermatologist for severe cracking, chapping or breakdown. Healthcare workers who have direct patient care should not work with open, abraded or cracked skin. It is the workers responsibility to report this condition to his/her immediate supervisor for adjustment in job duties or appropriate referrals. Take care of your skin at home too. A "recipe" for healthy skin: Always wear a sunscreen with and SPF of at least 15, look for one with UVA and UVB protection. Avoid the sun in the middle of the day. Cloudy weather doesn't protect you from the sun's damaging rays, so wear sun block then too. Avoid tanning booths, they are as damaging to the skin as the sun's rays. Eat a diet high in fruits and vegetables containing antioxidants needed for healthy skin. Don't smoke and avoid second hand smoke. 1. Name three measures that can be taken to prevent dry skin.